I was working and a little voice said in my brain, “this is too easy.” (This wasn’t the negative inner critic because I was revising, not creating – and if I haven’t spoken about Negative Inner Critic before, I’ll be doing so more often in the future). "Let’s loan the money…" T'Holly said. The Captain of the Council and her neighbor, Bucus T'Elder's heavy jowls quivered. Ailim saw calculation in his eyes, felt a wave of greed from the man. "This is too easy for D'SilverFir." Ailim stared at him, barely keeping her mouth from falling open. Easy? All the mental battering she'd taken, all the talking and arguing? Showing up here and begging? Easy? There’s a point to this Too Easy blog. The above passage from Heart Thief was from Chapter 1. The revising I was doing that triggered the little voice was in Chapter 2. Take the first example. My heroine needed to get the loan because the loan had conditions. If her Family failed the conditions, they’d forfeit the ancestral estate. That’s SET UP. Struggling to get the loan was not part of the story. I couldn’t take time to have my heroine fight and master this problem, I had other conflicts and issues for her to solve. Of course, I might have added it in a little backstory….”it took Ailim three months to convince the FirstFamilies Council to meet with her about the loan…” Maybe that would have been better, but as it was, I needed Ailim sleep-deprived and unobservant. Embarrassed and hating being in the Guildhall to beg. The point is that problems being solved (which will lead to worse problems down the road, i.e. my heroine failing to meet the conditions of the loan), can be solved easily in the first couple of chapters if it is part of the set up of the story. May your characters sink deeper into thorny problems today. The sky is powder gray with not-powder snow slanting down. The white stuff on the ground is pristine but for the slight indentations of feral cat feet, already filling in. The square rust-colored plastic container is more than half full of grainy but dry cat food. No sun to gleam and glisten on the snow sheathed bare branches. Only the teasing scent of cold, of ice, of winter air. The scuff of my boots disturbs the white ground and adds sound to the morning landscape. When I reach the bus stop I stand with two men, vague neighbors. I am early, but I could not settle back into the rich warmth of bed and sleep. We look at each other, but we don’t talk. The snick, slick, slither of falling snow hits my nylon hood. Not powder. I do not trust this city sleet-snow. I do not taste it. My mouth remains minty from toothpaste. I am an over-civilized woman. May you use all your senses in your writing today. One of my long-time critique buddies had her first signing for her first book last night. At the Tattered Cover which is THE place to have a book signing. And the bar for a signing event has forever been raised. A few months ago, Mario Acevedo (Nymphos of Rocky Flats) had a signing where some of the theater group he works with gave little skits about the fears (this book is trash) an author has about people reading his/her work, and the hopes (we’re blown away by your talent, take me, take me AND my sister…). Naturally Janet attended and it gave her Ideas. As the director of her own group of town players, we had the Singing Synopsis of Tabor’s Trinket last night. FABULOUS. Well, not only can Janet write, and write songs, but I think I’ve mentioned that she is the best plot person and synopsis person in my group. Much fun and laughter was had. Janet also followed Mario’s examples in raffling off her critique buddies books as gifts. Much to my surprise. So I autographed Heart Quest to another Robin (spelled the only way Robin should be spelled, she said). So the signing was wonderful, and the book is GOOD. Of COURSE I gave it a cover quote. Some fascinating information about medieval gypsies (they were once thought of as nobles from another land). Bottom line, everyone had a good time and she probably sold more books because of that. And following this is gonna be tough. May your writing entertain today. Is every day too often? Would weekly or biweekly (either 2ce a week or once every 2 weeks, whatever) be too much. Do you skip because it feels like a chore? If you skip, do you go back and read? Are the blogs too long? Now, stuff not about me. When do you usually read the blog during the day? Are you on a blogroller? May you be Just Right in your writing today. Then Calli Torcher might ride again. But a devastating accident left her in such pain, she thought the chimes and chanting in her ears were a hallucination...until she found herself transported to another world, and met the Lladranans who had Summoned her. Lladrana was a parallel, magical earth filled with exotic creatures, noble humans and magic– all threatened by an encroaching evil. This appears in Romance Sells a free booklet that goes to booksellers and libraries from Romance Writers of America. They also include my city, state, the ISBN, and the release date. May you make your writing goals today. May you face no blank space today. I suppose all over the blogsphere there will be stories of Family Thanksgiving. This isn't one of them. It was good, there were snippets that I could weave into a charming story, and we've had some horrendous Thanksgivings (which I will spare you for now). I won at Yahtzee. Pretty cool. Anyway, back to topic. Sometimes I'm too subltle in stories, I think what's in my head has made it on the page, so that's a flaw I have to watch for. It can also lead to repetition to get a point home, especially in genre fiction. You really don't want your reader to go "Duh," and scratch their head because they might not buy you again. So there's a balance. I can be repetitious, too. Yesterday I listened to a short story on NPR, (if you want the details go to http://www.npr.org) I could critique it, and it WAS a charming story, but I believe the end was ambivalent. And I think the author wanted the end to be ambivalent, because I'm still thinking about that story and will probably gnaw it over a couple of more hours before I settle on an ending in my mind. Which is a good thing for a short story, I think, but not in the fiction I write. A satisfying ending is important. In romance, a Happily Ever After is part of the definition. So I view the story from that objective. The point is: if you want to be subtle and your genre allows you Go For It. But be aware of reader expectations. I think I expected a little too much from the story because of my background, and though I enjoyed the story, since it WAS too subtle, I probably won't be picking up any more of this writer's work. I think I needed more indication of how the story will turn out, or if there was a true ending, and idea of the characters real feelings, though as I am typing I guess I'm finally getting it. So, with the story being subtle, I'm not sure of the author's intentions, which makes me, the reader, feel a little stupid. And maybe I was, maybe a lot of people "got it" and I didn't, and that makes me feel even more stupid. Choose your subtletywisely. Too little and you can be boring and repetitious, too much and you can leave the reader feeling stupid. And since I feel I'm rambling, I'll leave it at that. May your writing please you today. may have talked about this before, and we may have discussed it, but since I want to talk about it again, and the blog has many messages, I figure I can repeat myself. Names are a Very Big Thing in my writing, and what I call my person, and what name they call themself or respond to is always significant. Take poor Mayblossom Larkspur Bella Hawthorn Collinson Holly (and at one time it was …Hawthorn Collinson Apple…). She had too many names, and her grandparents were Heathers and personality-wise, she was more of that family. Holm (her hero) didn’t like calling her anything that anyone else did, so started the Bella thing (there’s an accent on the last a). But as Heart Duel wore on, Lark reacted to Mayblossom, accepted Bella from Holm, and managed to work through the grief for her first husband (Collinson). I’m always fiddling with names, mostly because one of my main themes, if not THE main theme I always write about is determining your own identity, accepting who you are. There’s Alexa Fitzwalter in Guardian of Honor. People can’t say her name. In dialogue it’s always (barring copy edit errors) Alyeka. Or my magical being Sinafin, who wants to keep her name secret because names are power (and a reader pointed out that I’d let it slip to everyone in Sorceress of Faith, so I found a reason to change it in Protector of the Flight). The people who can pronounce Alexa’s name correctly (or take the time to learn how to do so) are important in the story. The fact that they CAN pronounce her name endears them to her. And this was all started when I called my brother to ask what to bring for Thanksgiving (ok, I’m writing this on Tuesday, though I anticipate it’s Turkey Day when I’m posting it). “Hey, Tom,” I said. “This is Rob.” You see, everyone in my immediate family calls me Rob. The kids call me Auntie Robin, but my brothers and mother call me Rob. I don’t think I am capable of calling my brother and saying, “This is Robin.” It doesn’t sound right, especially after I hear his voice. If you shout “Rob” in a room, I’ll look around and answer. Then there’s Robin D. Owens. The author. The full name. Recently on one of my lists (since I always sign Robin, http://www.robindowens.com) someone said they’d read that and didn’t recall that there was a Robin on the list, then realized who I was. She always thinks of me as Robin D. Owens. And since I type that so often, I know that persona, too. But Robin D. Owens doesn’t go to family Thanksgiving, Rob does. So names are important to me, and if you explore themes similar to mine, they will be important to you (and your characters), too. May you find just the right names today. I’ve been wondering whether Guardian of Honor is shipping well from amazon and I went there and saw the cover of Heart Dance. I’ve had several shocks with covers – mostly because I send a bunch of concepts and I get strange stuff, like sending amber necklaces and silver vases and armbands and getting T’Ash with a tattoo (I love that cover, but it WAS a shock and made me snort with laughter). Or sending several pair of boxes and one bracelet and getting the bracelet (Heart Choice). But this really IS a shock. I gotta do better work with regard to sending info re heroes and heroines. Saille Willow’s house color is scarlet (I got tired of green everything). On the cover he’s dressed in gray and gold. And I really, really, really should have emphasized that it’s Winter. Bone-chilling, white-out-blizzard-blowing, snot-freezing-in-your-nose WINTER. Now, to fix. Saille has a conservatory, I can put him in there in purple winter evening light. The clothes – well I suppose I can say he dressed casually. 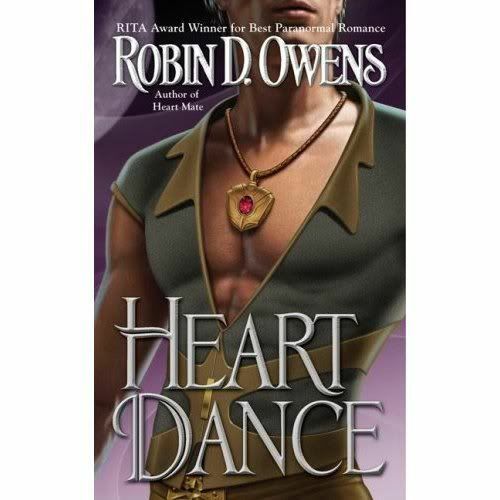 I’ve been describing clothes in Heart Dance and none of them look like what he’s wearing. I’m not quite sure what his necklace is, but I can add the piece if I wrack my mind long enough. His creativity is as a potter. That could be a clay leaf with a jewel, right? Or maybe a rune that he uses in matchmaking. Huh. **secret smile** just got a good idea. OTOH, it makes for another good cover story. I have stories about them all. May you visualize your story well today. Do you notice what's new? I did it last night (ok, it IS Last Night, Monday at about 8 pm). I've got a blog about it for tomorrow (Wednesday). I had a signing yesterday. Yeah, yeah, I know. I didn't publicize it in any way (except maybe I put it on the RMFW loop). My brunch friends didn't know until I showed up in velvet (the blouse on this pic and some black velvet pants). The air was cool all day so heavier material was called for. Brunch had many, many people due to the particular crisis that village is going through, and since no one else has spoken of it on the net, I am not going to be the first to announce it. The village knows and that's enough for now. When one of the primary movers and shakers of this village (or, rather, one of the epicenters) sees fit to talk about this on live journal (I have an account I never use except to leave comments), I'll talk about it here. ANYWAY, sorry for the digression, T. The best thing about signings is when someone comes up to you with a load of previously purchased and READ books and asks you to sign them. Really, FABULOUS. So thanks, T., and I'm not using your name because we are in a public forum. Like I said, you made my day, and when the other authors you like sign and you go to THEIR signings, always know that they like to sign books. Otherwise, the new Borders was lovely (and makes a to-die-for hot chocolate with chocolate syrup swirls, shavings of white and dark chocolate...yum! ), the other authors -- Lizzi T. Leaf, Cindi Myers, and Kally Jo Surbeck were wonderful company. I stared at Elizabeth Lowell's new book. I wanted to read it, but I don't quite trust her. Elizableth Lowell is a great favorite of mine, especially with her romantic suspenses with more than a dollop of romance. But she is also the Queen of Angst. I've read most of her books and some of them were SO incredibly wrenching. I definitely do not need any fictional wrenching in my life right now. RL is doing fine with that. One of my best writing buddies, Sharon Mignerey, is also incredible at emotional angst (you noticed there was an "Most Emotional" category in the Anne Bonney contest, right?). Sharon would bring her pages to critique with a grin. "I'm going to rip your heart out." I love Sharon, and I love her writing, and I buy her books and read them, but I definitely flinched when I heard that. She is wonderful at angst, too. And most of the time I really don't want my heart ripped out. (I prefer my heroines to do the ripping -- literally). So I passed on the Elizabeth Lowell book. But only for now. Not only are her stories wonderful, her technique is great to study. When I feel I can handle some real angst, I'll give it a shot. May you write incredible emotion today. build their houses. You might be one of the greatest people of all time. You'd be recognized as such if you weren't always talking about talking rabbits. A writer always takes things away from every book they read, may your writing include brilliance today. I was listening to The Search by Iris Johansen and found out it was abridged. I don't often listen to abridged, but I really wanted somethng for the car. Anyway, what I think is that they cut most of the character motivation and left most of the plot. There was just enough character stuff there to make the story rather believable. Now, as far as I am concerned, motivation is key, because if you don't understand WHY a character is doing what they are, the story is unbelievable and you lose the reader. I'm pretty sure the heroine's growth arc was trashed. So I'll go buy the book to really find out what happened. I don't like abridged books, and if I were the abridger, I wouldn't want my name on it. I've learned that some books only come out abridged in audio. Since I have the audio rights to all of my work (and haven't tried to sell them yet), I can take the high ground and say that I don't think I'd care to have my work out there abridged -- though, it might make readers go back to look for the full work, as I'm going to do. So it's a tradeoff. What do you think? May all your work come full-fleshed for you today. I’m reading a NY Times selling author and s/he gave two different backstories for a character. It’s bothering me, and I’m near the end of the book and don’t think the discrepency was on purpose and will be paid off. I believe this author only writes one book a year and I wonder why the mistake wasn’t caught. Doesn’t s/he read the copy edits any more? Or is it simply that everyone missed it except the reader? I don’t know if this author has reading buddies. There was an additional little choreography glitch, too. Now I KNOW that these things happen. A story line gets changed and something isn’t caught, and I hate to sound patronizing (especially since every time I do, I find myself in the same shoes as the person I’m thinking confused thoughts about). But someone should have noticed the glitches. Maybe it was a hard book, a rushed book. Readers never know. Still it bothers me, the reader. It feels sloppy. I think the only way to make sure this doesn’t happen is to have Fresh Eyes look at a manuscript, probably at the final page proof/galley stage. Sometimes that’s not possible (time is too short to find Fresh Eyes and have them read it). I hope the author hasn’t gotten blasé about such mistakes, but I don’t think so. We all want our work to be perfect. So, line up your Fresh Eyes. May all your choreography dovetail today. Not sure what to say this am. Not feeling like writing about writing and publishing. And though I am pretty much obsessed about it, life DOES get in the way and hit you over the head with bad things and attracts your attention. Bleh! And am I going to fix that sentence. No. Got bad news last night, but news I am not free to spread around. And Scorpios do keep secrets. So consider the above a not-so-great example of Stream of Consciousness writing, the first of which I know of being Tristam Shandy by Laurence Stern published in England in the 1750s. An older technique than you expected? Might be even earlier in non-English cultures. I’m sure someone’s studied that. Take care, and may your writing be uplifting today. I'm pretty sure I'd enjoy being a comet chaser. So, future careers for your characters anyone? May your characters know their bliss today. I think one of the reasons that Guardian of Honor won Best Heroine is simple: it was the longest book of the three finalists. I had the length to explore Alexa’s character more than the other two authors, make my character deeper (though with Alexa, it was pretty much what-you-see-is-what-you-get). Still, the readers definitely spent more time with her. AND, Luna publishes heroine-based stories. The focus is on the heroine and her inner growth and triumph of great outer plot problems. In romances, the focus is primarily on the romantic relationship between two people. So I had another advantage there. That said, I’m still smiling. May you discover unexpected gems in your writing today. See her jump up and down! See her hurdle bored cats! Hear her shout for joy! Alexa Fitzwalter of Guardian of Honor is Officially the Best Heroine in the Anne Bonney Readers' Choice Awards. Guardian will be included on a poster sent to bookstores the beginning of next year. And may all your heroines be BEST today. I am very conscious of my hands. The rings I wear that flash when typing or distract -- right now, only one. The rings I wear when signing are usually for that book. I have a peach colored heart, and a green heart (Heart Thief). The bracelets/watches I wear for signings are the same. Pearls (like in Heart Duel), or for the PEARLs I've won (Paranormal Excellence Award for Romantic Literature). So, have you given your character's hands any thought? Do your characters gesture a lot? My day job project will definitely end by November 30 and I somehow doubt anything else will be found for me here. Not sure what my agency might have. I was thinking today (which is incredibly warm for November, in the upper 70s) of the winter. I would LOVE to watch the snow fall and pile up in drifts and be tucked warm and cozy inside and write and work. That isn’t going to happen. I can’t afford it – unless I cut other expenses like book promotion and make heating the house a priority. My automatic thermostat is set for 55 during most of the day with a little bit of luxury – 65 – in the morning when I usually wake and in the evening for an hour. At night, the heat drops even lower than 55. I think I have it on 50. So I stay very bundled up. Layers. Gloves with fingertips cut off. I’m thinking of buying battery operated socks. I hate cold feet. And though I’d rather work at home, I’ll probably be searching out libraries and downtown buildings and cool (literally) coffee shops to write. The community center where I voted was drab and shabby, but it is probably warm and could provide a table and outlet. What would your characters’ autumn wishes be? May you gain greater insight into your characters today. I set down three books this week. One I’ll be going back to, two I’ll probably skim. The one I was interested in most was a paranormal romantic suspense and I suspect it was the second in a continuing series. I put it down because there was a “going from here to there” scene in the middle which can be deadly (and, yes, I have one in Heart Dance but it’s in the beginning so I’m hoping revealing the character motivation/outer plot may save it). I put it down again because I had to do chores, then picked up another one which was upstairs instead of down. The second book had an interesting premise, but I now demand a higher standard of technique in books I read for pleasure. The execution of the premise didn’t hold me. The third book started sadly and I haven’t been in the mood for sad for a long, long time. So, this is my monthly/bi-monthly/whatever discussion on holding readers. The first book should have cut the scene, set it upon arrival at the ending point. The second book should be fine for many readers, but not those of us who really examine technique. The third book, too, should be fine for many readers as long as they aren’t looking for light-hearted reads. Two of those books failed to hold my interest because of the type of reader I am. Subjectivity again. There are some readers who, even if they want to like your books, you won’t keep reading. Will I read the authors again? Number 1, yes, sure. Number 3, if the author doesn’t start other books sadly. Number 2 if the author’s technique improves. I will definitely remember author #1’s name, I’m not sure about the others. May all your scenes be fascinating today. I stood in the 10th floor kitchen of the office building I work in for a few more weeks and looked at the jagged blue of the foothills. Towering behind them was a vertical field of white, white clouds. Bright sunlight tinted sun yellow lit the city streets below. Denver was having warm weather, but only one look out those windows spoke of a storm in the mountains that would eventually spill over the foothills and stream into the city. In the evening. Or in the night dark. Then rain and sleet and snow would come and make the streets cold and wet. I’ve lived in Denver most of my life and this phenomena isn’t new, and I know of it. Outsiders, aliens, the few transplants from New Orleans we have might not understand this. How much do your characters know of the climate around them? Are they sensative to it or not? How do you use the climate to set the tone of your book? Do you use it as an additional character? What if you read the above paragraphs and I added: She opened the mailbox and her heart lurched at the familiar writing on the envelope, the return address. What if I added: And something that preferred the cold and dark and wet came out to prowl the streets. What if I said: The sweet melancholy of autumn sifted through her and made her smile. Today was an ending and a heady beginning. See how you can do this. What you can do with description and climate. May weather stir your story today. I turned in the proposal for the last three Luna books on Monday night. I wanted to revised them according to comments from my critique group one more time, but I was shamed by folks at the WFC to get them in, even though I think they're rough. The pages are fine, it's those wretched synopses. I've found that when I'm travelling, I will buy a book I've already read before sooner than I will something brand new. That isn't to say, comfort reads, no one could call Suze Brockman a comfort read, she is too exciting, but something I know the twists and turns to. I don't especially want my mind to be challenged, I think. I wonder if I'm alone in this. If I'm not, all those airport shops carrying only the newest best sellers aren't as savvy as I thought. Gotta go bone up on issues so I can vote on the dot at 7am (or near to, bound to be a big turn out). May as well read the League of Women Voter's literature in the bath. May you have an interesting twist or turn in your work today. World Fantasy only lightly schedules programming (1 track, perhaps 2 and readings), so most folks can hang out and network. The books in the bags were heavy, and there's a table to exchange if something doesn't look good to you and you don't want to haul it home (I placed some there and they were gone in 5 minutes). The green room was excellent with just enough food (though they ran out of black tea except for leaf and didn't have any strainers), really, the green room was excellent. The con suite had loads of food, sometimes was rowdy as people ebbed and flowed, sometimes great for a quiet moment. I had some good conversations there. Since, I believe, each convention committee (concom) is different because it's hosted in different cities, and the volunteers have no life outside this for some time, I must thank them for an incredbile job. The art show was small but with very professional work, most of it out of my price range, though I did buy two prints for the office. I rather wished the dealers room sold more than books, but that's my preference. That's the set up for a sf/f convention. Thanks again to the concom. May you be well appreciated today. Anyway, a good con. Very interesting, a lot of networking, REALLY enjoyed meeting all the other Luna authors in one place and talking to them. I'm sure by the end of the evening, most of my wallet calendars were gone. I think there wer only 20 or so when I last saw them. So, all in all, a very good convention. May you enjoy the company of other writers. FIRST, IF I MISSED YOU AT THE SIGNING LAST NIGHT, PLEASE COME UP TO ME WHEREVER I AM (EVEN IF I'M WORKING OR IN A GROUP) AND ASK FOR ME TO SIGN YOUR BOOKS. I AM WEARING THE BLOUSE YOU SEE IN MY PIC ABOVE...AND I WEAR GLASSES! Yes, the Luna authors here (except Michelle Sagara) went out to dinner last night with our editor and got back to the signing late. All the tables M-Z looked crammed, so I really didn't set up until I found out people were looking for me and I sat between Maria Snyder and Gail Dayton. But I think I escaped someone, so FIND me. Renewing acquaintance with the Luna ladies, and meeting Laura Ann Gilman, was a lovely part of this con. The reading went well yesterday, though I was hurrying since I went first and I wanted everyone to get a chance. I don't know about Jeri Smith-Ready, but I think the other three of us were nervous. Gail said she's nervous until she gets "on stage" then calms. What else? Mostly hung, looked at the art show, my roomie, artist Laura Givens, has made contact with a couple of people to work for, so she's chuffed. Went to lunch with the Luna ladies so we could talk before dinner with our editor, then our editor walked in during the afternoon and we had business discussion then and more socialization later. Got up this am with a couple of sentences running through my mind on a VERY different project I have the 1st chapter for, so thought I'd come down to the breakfast room, write this and work. Will be leaving at about 4am tomorrow am, so don't look for my post unless I upload it at one of the airports...or until I get home at about 1pm my time. May you be enthused today. (and may you NOT give yourself a deep papercut on your ring finger of your right hand or closed your right thumb into a dresser drawer). Well, in Austin. Got up VERY early (2:30am) to get ready and fly. Biggest glitch was the Alamo rental car. They had a line and tried to sell many features to each person, which dumped me and my friend (Laura Givens was waiting for me, her plane had come in earlier and was one gate away) into rush hour traffic, which, with a couple of accidents, was nasty. Also directed us to the wrong Fairfield Inn, despite me saying NORTH. I could go on but that's enough. Anyway, had planned on meeting up with some of the other Luna writers and looking at bats, but the bats have left for Mexico (Austin is having cold weather -- 64 degrees -- so I guess the bats knew it was really fall). We did sit close to the others at dinner (space was too limited at the tables of the restaurant to actually sit with them). Registered at the conference (green room was closed) had a drink, went up to the con suite. I have a reading today that I should practice for. Laura is still sleeping, but the alarm should wake her momentarily. May you have a pleasant society of writers today. 2 hours before I go and I left a lot of stuff for the last minute. My computer is NOT recognizing my PDA and I wanted to transfer stuff. I think the USB cable went bad, but I sure don't have time to mess with it. Murphy's Law, I guess. I'll keep you informed. I dread travel days anymore, and since I got a cheap flight, I also have to transfer. I have a feeling that every little glitch is going to irritate me and I'll be in one of those teeth clenched smiling moods. May things go smoothly for you today (and I'd like the same blessing please). This morning I haven't thought about what I should talk about. This is Nanowrimo (probably not spelled correctly) where people commit to writing a book. I only learned of this November obsession AFTER I was published by my friend Richard, who recently (last week) had part of his brain cut away. I don't know if he will ever write again. And I didn't mean to say that, but apparently it's on my mind. His family is being very frustrated by the health care bureaucracy. I heard that the insurance companies have come together with a plan for universal care but won't announce it until after the elections. And I wonder how much this plan will put in their pockets. Maybe like social security where a little of your paycheck goes to them. But I think I'll get off politics. I know people don't agree with me and this is supposed to be about writing and publishing. Remember that publishing is a business, and for big publishers it's a big business. No matter how an author WANTS to forget this, it is always about product and the bottom line and no one in the publishing business forgets that, including your editor. The honeymoon eventually ends, the shine goes flat. I tried to keep the shine on as much as possible, hated hearing bitter writers talk when I was in my first daze of delight of selling. Believe me, I am not nearly as bitter or cynical as many writers. But you can't ignore the business when your dreams and the reality of publishing collides. Keep the faith, believe in yourself. May your day be full of the pleasure of writing.